Texas, the state that flew solo for nine years, gave us the epic loss at the Alamo, and ranks number one in state pride, has added to its long string of accomplishments a “world class” and “exceptional” list of social studies textbook requirements. If I’ve learned anything from my mother, it is that when you change one thing, that means you’ll need to change another thing eventually, and thus, it’s better to innovate and renovate all at once because things have to match. Always. For this reason, I think that it’s important that the cowboy hat-wearing, “everything is bigger here”, free market-loving Texan Conservatives finish the drill. They’ve got some great conservative, religious-friendly, white-affirming curtains, but the coffee table and carpet should be styled to suit. Below is a list of 1000% super serial provisions that should, in congruence with what has already been proposed, be included in the Texas textbook revised list of requirements. The Great Society set of programs implemented by Lyndon B. Johnson, which had the liberal and thus terrible goals of ending racial injustice and eliminating poverty, shall be referred to at all times as the Marginally Successful Somewhat Mediocre Society. It will also be noted that while Lyndon Johnson himself was from Texas, he, due to his liberalism, is under no circumstances to be considered a Texan. To accompany the elimination of “hip hop” as an important cultural movement, we will be adding that Johnny Cash’s album “Man In Black” is the greatest musical accomplishment of all time. It will also be noted that Bob Dylan frequently accompanies the Devil to gay bars, reads Howard Zinn, doesn’t know what he’s talking about, can’t sing that well, and never should have gone electric. “The Trail of Tears” shall be re-named “The path of excretions from the eye caused not by sorrow but rather by an averse reaction to pollen and dust in the air at the time”. It shall be clearly enumerated that the reason Rosa Parks didn’t stand up and surrender her seat on the bus was because she accidentally sat on six pieces of gum and could not physically rise – not because she was protesting a terrible and oppressive system. It will also be noted that she was not a cute old lady. The Sherman Antitrust Act shall be known as the Sherman-shouldn’t-have-interfered-with-the-free-market-and-neither-should-you act. Along with the terminology BC and AD, which every other institution of higher learning has forsaken in favor of BCE and CE, Texas textbooks shall qualify dates with an additional BR(MPBUH) or AR(MPBUH). An example: “Jerry Falwell founds the moral majority,” 1978 AD-BR(MPBUH), which means 1978 Anno Domini, Before Reagan – May Peace Be Upon Him) OR “Liberals further environmentalist agenda by sabotaging BP oil rig in the Gulf of Mexico,” 2010 AD-AR(MPBUH) (2010 Anno Domini, After Reagan – May Peace Be Upon Him). The language “1859: Oregon admitted as a state” will be changed to “1859: Liberal Oregon sneaks into the union”. Coverage of Franklin Delano Roosevelt’s socialist New Deal will be replaced with facts about inconsequential Republican President William Howard Taft. Its not that we don’t like the New Deal, its just that there are more important things to learn. 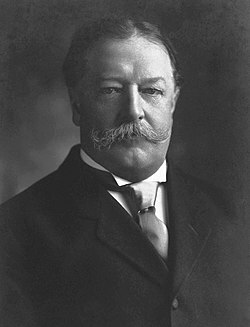 Taft was, after all, the last American president to sport facial hair. That’s one mean mustache. Note the curled ends. Special notes by the authors in the books should also include that Watergate was a liberal sabotage of a conservative sabotage, that we didn’t lose Vietnam – we were just concerned with the North Vietnamese’s self-esteem, Ms. California was the victim of the liberal news-media and is the rightful Miss USA 2009, and that Texas is not sorry for staring because apologies are un-American and should be reserved for use by tree-huggers, liberals, and Tiger Woods. Note: self esteem doesn’t matter or exist. It is a lie invented by hippies and liberals. If you don’t agree – you don’t love America.